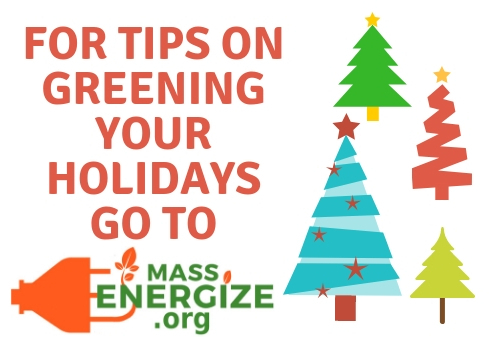 We recently had the opportunity to connect with the organizers from Mass Energize on how we all can “Green Your Holidays.” Mass Energize Wayland is a local, grassroots group focused on providing metrowest residents with ways they can make a positive impact on the environment. It was founded by Kaat Vander Straeten and Ellen Tohn, two expert environmentalists. 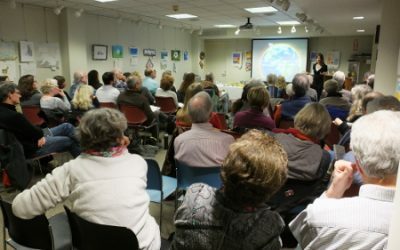 “The most impactful ways to ‘Green Your Holidays’ may take people by surprise, but our top five list is based on the scientific evidence provided in the novel, Drawdown: The Most Comprehensive Plan Ever Proposed to Reverse Global Warming,” ([http://drawdown.org/]) says Vander Straeten. Give your home, condo or apartment the gift of sustainable power. The collective impact of making the switch to solar or wind power is substantial on carbon emissions, and because both sustainable power options are still a relatively new technologies, customers may see their costs decrease as both industries become more efficient. Good news, it is cheap and easy to run your home off 100% wind. 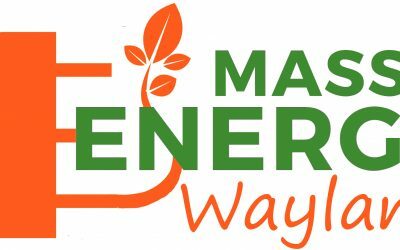 Locally, Green Energy Consumers Alliance has a program that works with your electricity provider to make sure that every kilowatt of energy your home takes from the grid, is replenished with that same amount of 100% wind energy going back into the grid. “The average household pays $10-$20 per month for renewable energy in addition to their regular electricity bill,” according to Greenenergyconsumers.org. Mind your food waste. There is a lot of behind the scenes work that goes into food production, including all the energy used to refrigerate or freeze a variety of foods. When you throw food away, all the energy that went into that food is simply wasted. If you are hosting a festive gathering, consider buying some food storage containers for guests to take home. 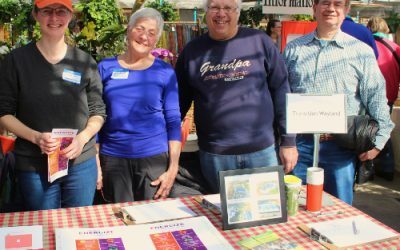 Local company Preserve Products makes beautiful reusable food containers from recycled plastic. Plan your menu mindfully and if anyone complains, take the opportunity to educate your guests on the dirty downside of food waste, most of which ends up in landfills and creates added methane gas, a greenhouse gas that is accelerating climate change. 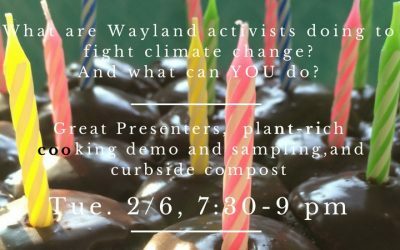 So the dinner you made and then didn’t fully eat yesterday is increasing your personal—and our collective—carbon footprint. Embrace a plant rich diet. According to Drawdown.org, “If cattle were their own nation, they would be the world’s third-largest emitter of greenhouse gases.” Over the holiday season, this may mean swapping out a beef wellington app for spanakopita, or simply opting for a hearty vegetarian soup. Green Leaf restaurant in Framingham is a delicious option for those interested in exploring vegetarian cuisine. “Our family is not vegetarian, but our friend, vegan chef Diana Goldman (www.beantownkitchen.com) inspired us to eat more plant-rich meals, and it has been an overwhelmingly positive experience, full of tasty, hearty meals that we all look forward to eating,” says Tohn of MassEnergize. “In my family,” says Vander Straeten, “meat is a small portion of our diet, and it is always sourced from local farmers who raise their animals in a regenerative way: their herds actually help sequester or store carbon in the soil. If we’re going to eat meat, this is an exciting and hopeful endeavor that we can support.” The organizers of MassEnergize have shared some of their favorite vegetarian recipes at www.massenergize.org. Extend your holiday spirit of generosity to organizations that either educate women, foster family planning, or some combination of the two. The math here is simple. Globally, the more education a women receives, the fewer children she has, the less children she has, the fewer people we have, the fewer people we have, the less resources we all take from the environment. Two local organisations doing great work in this space include Rosie’s Place (www.Rosiesplace.org) and Pathfinder International (www.pathfinder.org) amongst many others. Green your holidays with LED lights. Let your home shine brightly all season long while you enjoy the cost savings of lights that use less electricity. Yes, you will pay a bit more for LED lights up front, but most LED lights pay for themselves in energy cost savings within two years. Think about the end-use of the items you buy. Can it be reused or recycled when the user is done with it? Can you choose a battery-free toy? Green Toys is a great brand to frequent for kids toys made from recycled plastic. When purchasing clothes, choose natural fabrics over synthetics like polyester, acrylic, and nylon. The manufacturing of many synthetic fibers is an industrial process that transforms petroleum oil into long, thin fibers. You may want to think twice before exposing your skin or your loved ones skin to the same oil that goes into vehicles. Patagonia, Toad & Co, Prana, PACT, H&M’s Conscious line and eBay are all great options for sustainable clothing. Get creative with your wrapping. “One year, we bought bright, reusable shopping bags for all our nieces’ and nephews’ gifts. They were a huge hit, even my high school age nephew was excited about his new bag,” says Maia Miskin of Mass Energize. What’s more, there are many options for sustainable wrapping, whether buying new 100% recycled wrapping paper, using scraps of fabric, or recycled newspaper. According to the CDC, “Americans throw away about 25% more trash between Thanksgiving and New Year’s Eve. If every American family wrapped just 3 presents in reused materials, it would save enough paper to cover 45,000 football fields” (source). Skip the lines and make something special as a gift. Maybe you are crafty or perhaps you make delicious sugar cookies. Challenge yourself to create a cool craft using earth-friendly materials or bake up something tasty using all organic ingredients. There are many possibilities! The moral of the story is this, there are many ways you can green your holidays, but the most important thing is to do something sustainable. 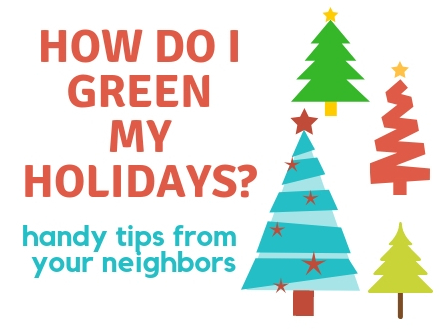 Make your holidays the most sustainable yet! NEWS: TW and WECC are now an MCAN Chapter!